The dark brown bell strap is lined with a separate strap of the same leather. 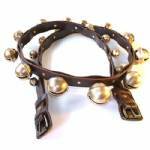 The two straps are fastened together with solid brass rivets between each pair of bells. The buckles are antiqued solid brass. Both are fitted with leather "safes" that protect the horse's hair from being pinched and pulled by the buckles. The "safe" is a detail sometimes seen on horse harness, but it is not very common. The main bell strap is 73" long from buckle to buckle. It comes with a separate billet that fastens onto the bell strap to make a circle that ranges from 81" to 91" around, depending on what holes the buckles are fastened to. This particular item is a custom, one-of-a-kind project made for a past client. Custom Projects are shown for information only; they are not available for regular sale.